Stitches and Scissors: On the look out. Purple and orange. Not together, as separates. Funny story that. 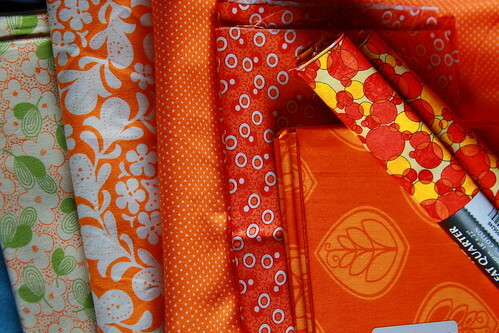 When I was having the lady cut these fabrics, she asked me what I was making and I said quilts. She then decided to tell me a little bit about fabrics choices. She told me that orange and purple do not go together! I laughed. (Inside of course so that I didn't hurt her feelings) I replied that I was just collecting fabrics for multiple quilts. 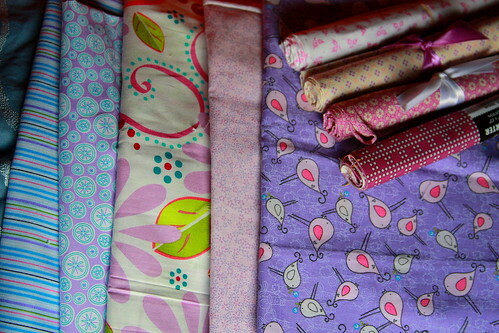 Who doesn't love to collect fabrics?? It is one of my favorite things. These fabric choices are not my usual. I am a little bit out of my comfort zone, but I was inspired by this and this quilt and decided that I like these colors! YUM and I love the story...I've been collecting eggplant and orange from magazines for months. i guess that lady didn't realize that purple and orange actually do go quite nicely together! they are nearly compliments on the color wheel, so they do have something of color harmony. I just found your blog today. The links to help with log cabin and the photos of these Spring looking colors is :) LOVE COLOR! Thanks for sharing, I am working on tops now and haven't mastered quilting them yet... (have outsourced that step so far) but, this is my year... I am going to start with something small... and hopefully never have to outsource again. Want to do it all! I was reading along and saw the pictures. First thought was "Hey, those oranges would have looked fantastic in the orange quilt I just finished." Next thought was, "I used that great purple bird fabric in my purple quilt". Then I followed the links. Those are my quilts! I am so flattered. Thank you so much. Trina, I told you I loved you quilts. They made me rethink these colors.